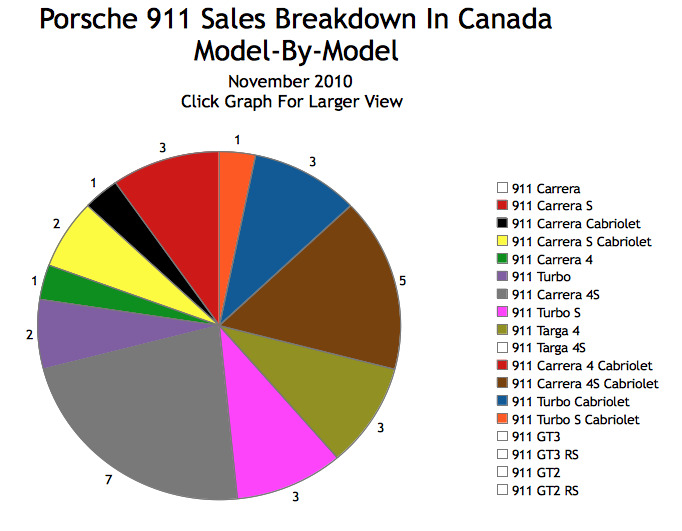 Porsche Canada sold 168 new vehicles in November 2010. 31 of those vehicles were 911s of one kind or another. Porsche sold 88 Cayennes, nine Caymans, eight Boxsters, and 32 Panameras in November. Porsche Canada has sold 1873 new vehicles this year, up from 1575 last year. 911 sales in Canada are up to 500 for the calendar year-to-data, 14 units better than at this time last year. 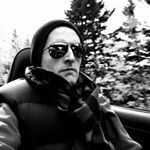 Curiously, however, Porsche didn’t sell low-end (if that’s what you’d call a base 911 Carrera) or high-end 911s in November 2010. In the Graph below, you’ll see the legend which points to vehicles in the white section of the chart. Except there is no white section in the chart. There were no basic 911s sold, not a single GT3 or GT3 RS; not a single GT2 or GT2 RS. That said, 16.8% of the 911s sold so far this year in Canada were of the GT variety: 23 were 911 GT3 jawdroppers; 60 were 911 GT3 RS kidney-tongs; and one privileged owner took home in a Porsche 911 GT2 RS. The privileged owner was not The Good Car Guy. As for the 911s which were sold in November 2010, they can be seen in all their sales glory in the accompanying Graph.